From today, November 25th until Monday, the 28th, I’m offering 25% of prints and 10% off commissions! To check out what’s available check out my Portfolio. To place an order or for more information, email me at, swartstudio@gmail.com. 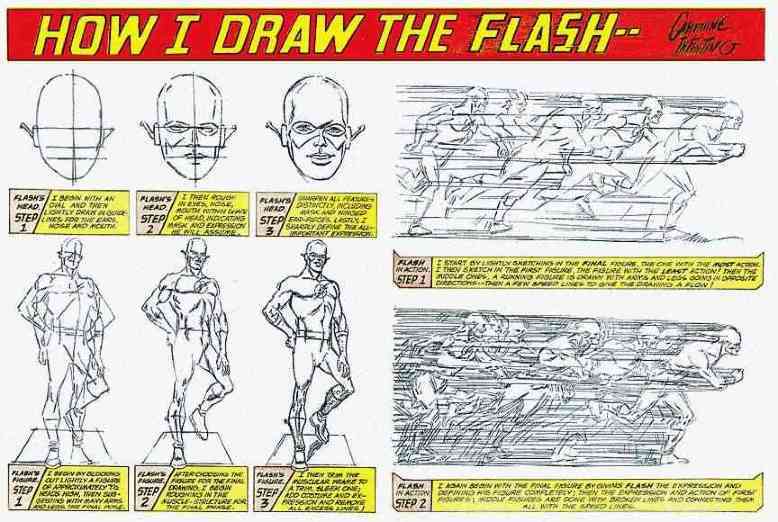 “How I Draw the Flash”, by Carmine Infantino, 1963. It’s no secret that I’m a comic book fan and that comics turned me onto art and lead to my career as an artist and art educator. Yesterday comic book fans lost one of the great creators who left a lasting legacy with his work during the Golden and Silver Age of comics. A touching farewell was written by his former colleague and popular comic book creator in his own right, Paul Kupperberg. Greenware, bisqueware, and glazeware, collectively. 5th Grade. The winter term has wrapped up in public school and slowly at the art center where I teach afternoons. This week has been a perfect week for me to reflect on students’ progress by reviewing past lessons and projects since mid-January. As a whole it seems everyone’s had fun and learned quite a bit. I’m pleased with the successes had then till now. 6th Grader working intently on his comic book. I get ‘a little’ excited talking about art. 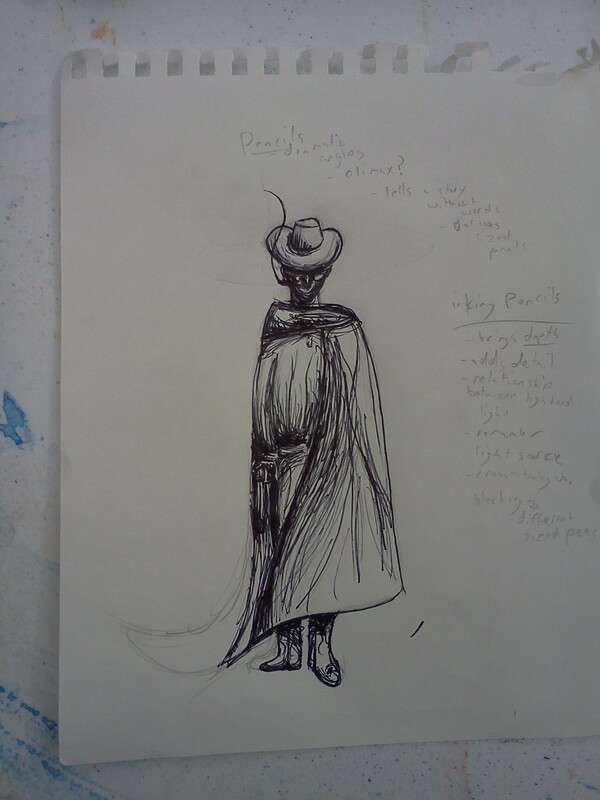 A cloaked figure by Ilan, 13. This week started off great after the holiday weekend! As the semester begins to wind down I’m giving students more freedom in class and seeing just what they’ve learned in class (and if they were paying attention these last several weeks). I’m starting with my kindergarteners and working my way up. Yesterday I asked my k’s to assemble from clay a pet of alien design for their action heroes that were created a week ago. I watched carefully as everyone created limbs and “scratch & attached” with slip to form unique creatures. After looking them over, each figure remained hollow (important during the firing process), was put together correctly with safe use of a pin tool, and all had its own story to tell. I’m very proud of them! The success continued with my seventh graders who have been working on drafting their own comic book. Many of the students have been wary of inking their pencils, afraid to ruin weeks worth of work. I requested that everyone practice inking a figure in their sketchbook after reviewing the steps. I was impressed with the end result and I think it gave the students confidence to proceed. One student showed me an example of a similar try out she had done at home, then compared it to her practice piece from class and expressed how pleased her work had improved. I’m glad the students are learning to experiment more with their art and, more importantly, have fun. My older students are beginning to develop their own style with their artwork and it’s exciting to be a part of the process as it progresses. 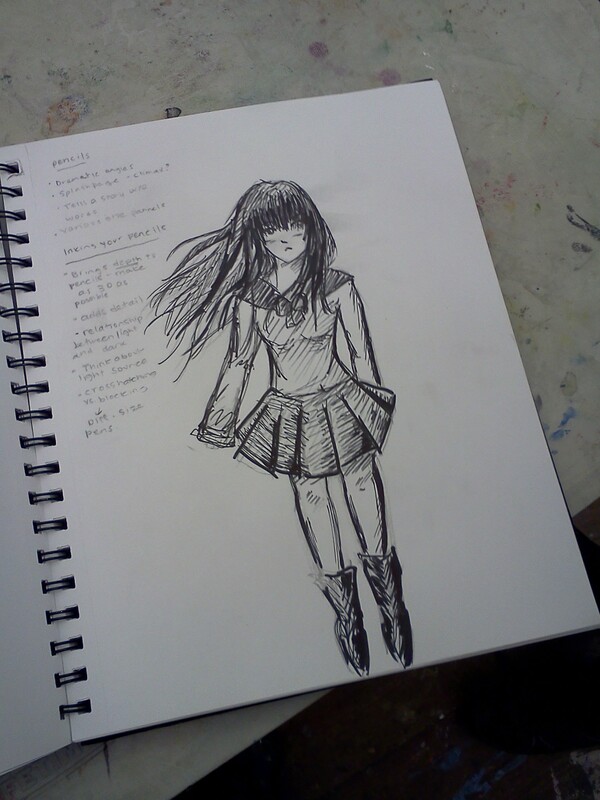 A manga inspired school girl/princess by, Sarah, 14.